As many of you know I luv to cook! It truly is my time to be creative, to have fun, and to provide a delicious meal for my loved ones. I find cooking to be enjoyable rather than a task. Cleaning the dishes after I cook, now that is the task! However, I do clean as I cook, so that does help make the cleaning process less cumbersome. In many ways cooking is an art for me. I can see a recipe and re-create it to fit my diet and/or I can start with a blank slate and make a dish from scratch. Traditionally, bolognese sauce is a sauce with meat, tomatoes, and a medley of herbs. 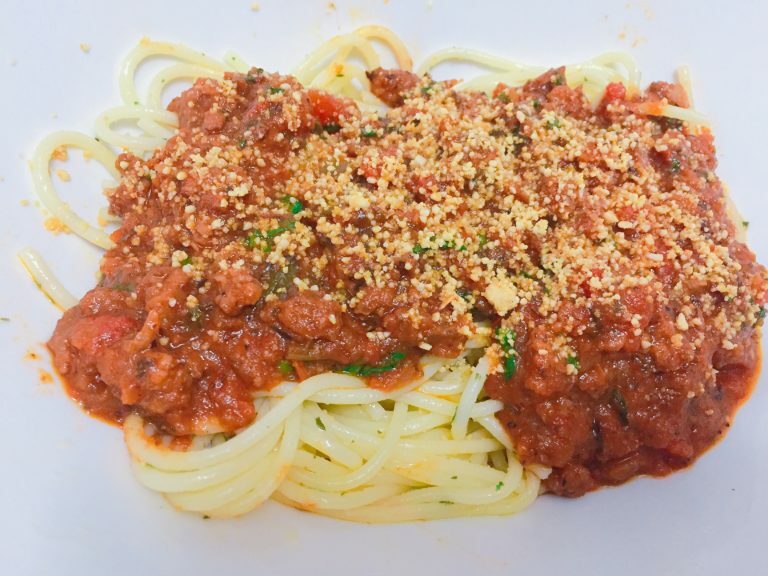 Below you will find my version of bolognese sauce that is all plant-based! My family and I did not eat any meat other than fish, so I simply re-created a traditional dish to make it friendly for my family and I. They loved it! They screamed for seconds and requested leftovers. This dish pairs well with a mixed green salad and your favorite I hope your family enjoys this re-created traditional, yet delicious dish just as my family did. Instructions: Heat oil in a large Dutch oven or skillet over medium heat. Add grated carrots and onions and cook for a few minutes. Make a well in the center of the mixture, and then add in the Beyond Meat Beefless. Cook for a few minutes until thawed completely, gradually stirring it into the carrot mixture. Throw in the oregano and basil. Use fresh if you have it; if you don’t, it’s fine. When the beefless is thawed and combined with other ingredients, make another well. Add tomato paste and let it heat. *Optional, Add garlic and stir to combine. I made mine without garlic, but I know many luv garlic in Italian dishes. Make a well in the center of the mixture and add red wine. Stir together. Add Worcestershire and stir. Add canned tomatoes. Finally, pour in nut milk, stir, and let **simmer for 30 minutes to 45 min—however long you need. I also took this opportunity to hide fresh finely chopped spinach into the sauce. As parents we are always looking for creative ways to get our children to eat more vegetables. Serve with your favorite **pasta and a generous sprinkling of ***Parmesan cheeze. **While your sauce simmers. Boil your pasta according to the packaging directions. Once your pasta has cooked. Drain and rinse. Toss pasta with a little olive oil, onion powder, sea salt, and dried parsley. We used gluten-free spaghetti, but any pasta will do! Instructions: Add all ingredients into a food processor and mix until fine consistency is achieved. Place in a mason jar or any air tight container and store in the refrigerator. It can last for a few weeks.